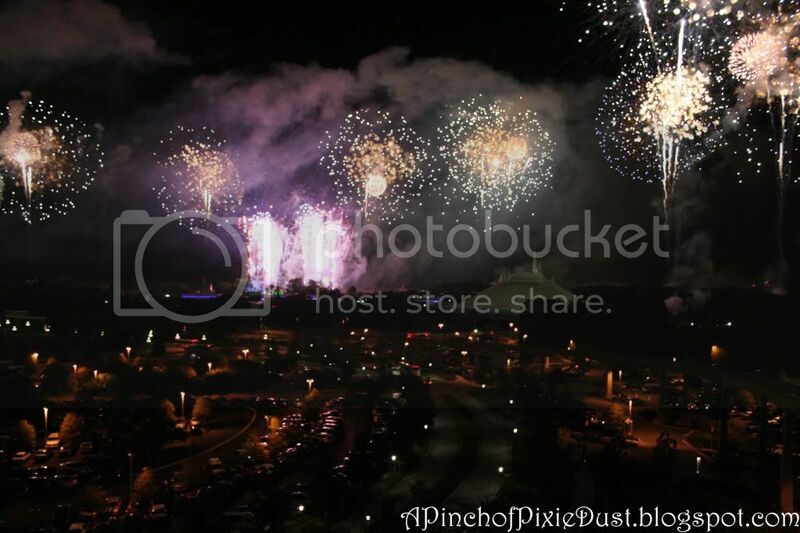 Independence Day is practically synonymous with fireworks...so you know that at Disney World they're going to pull out some pretty spectacular patriotic pyrotechnics. 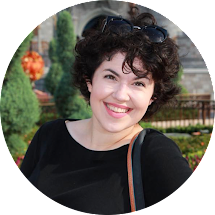 Unfortunately, everyone and their mother and their cousins and their dog also know about the fabulous fireworks, which makes the Magic Kingdom a hot mess on the fourth. 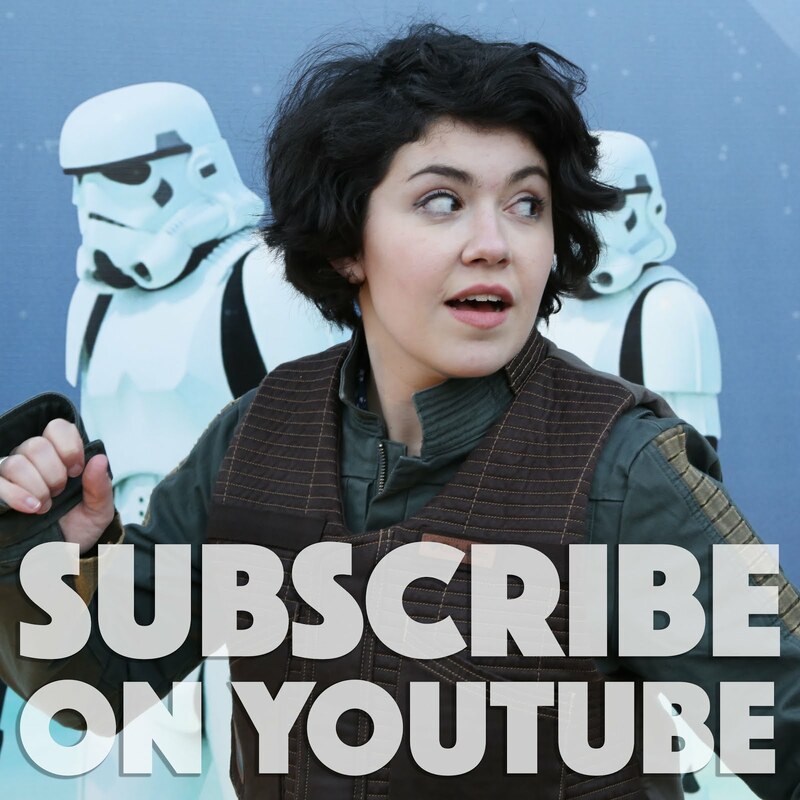 There was no way I was going into that park and facing the crushing crowds. 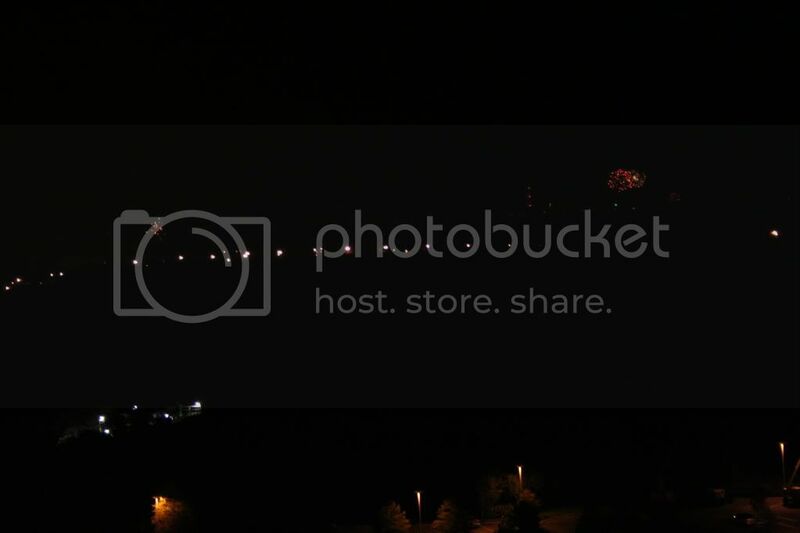 But I had to see those fireworks. 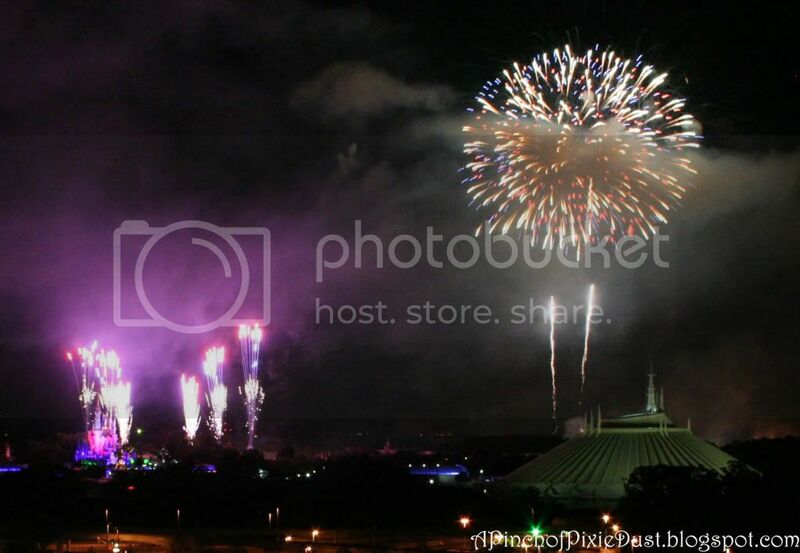 Luckily, as we all know, there are lots of options for Magic Kingdom firework viewing. The Polynesian beach is a favorite spot of mine, but I've seen Wishes from there so often (and also I've seen the New Year's fireworks from there) - I decided I wanted to try something different. So I opted for the Contemporary. 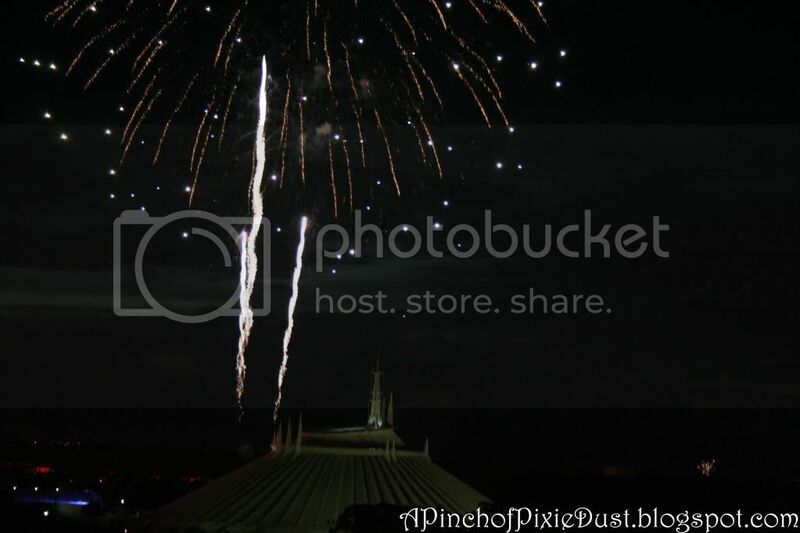 The stairwells are a fabulous place to watch Wishes from, so I had high hopes for the fourth fireworks. My brother was working at Chef Mickey's that night, so luckily I just got a ride with him. 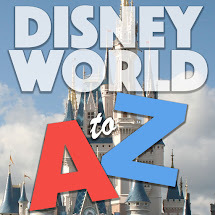 Unless you have a dining or hotel reservation, parking at a walking/monorail-distance-to-a-theme-park resort usually can't be bought for love or money on big holidays. And the Contemporary parking people have been pretty stingy even during low seasons lately, so I'm sure they cracked down hard. Knowing how crowded the park would be, I got to my spot early - tenth floor, west stairwell (the stairwell closer to the castle!). This was what the railings looked like at 8, an hour before the show was due to begin. 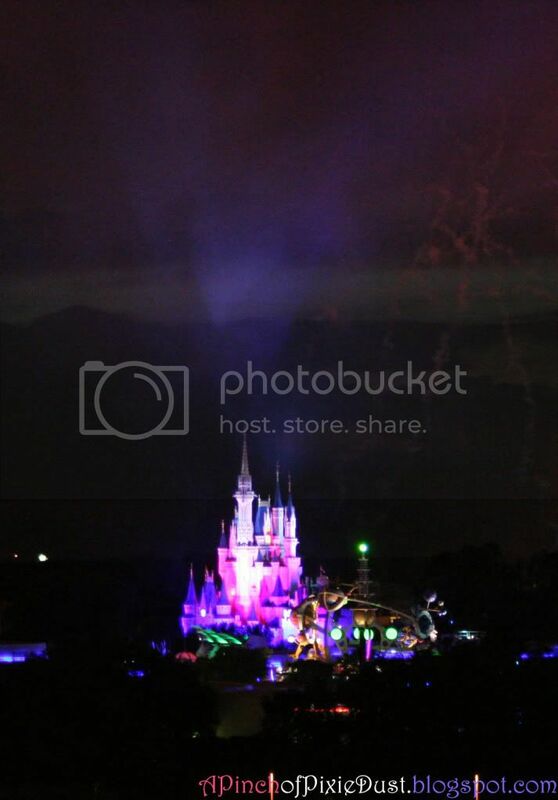 I didn't realize how fun that hour waiting for the fireworks would be. There was a rather festive mood, with everyone waiting for the fireworks to begin. 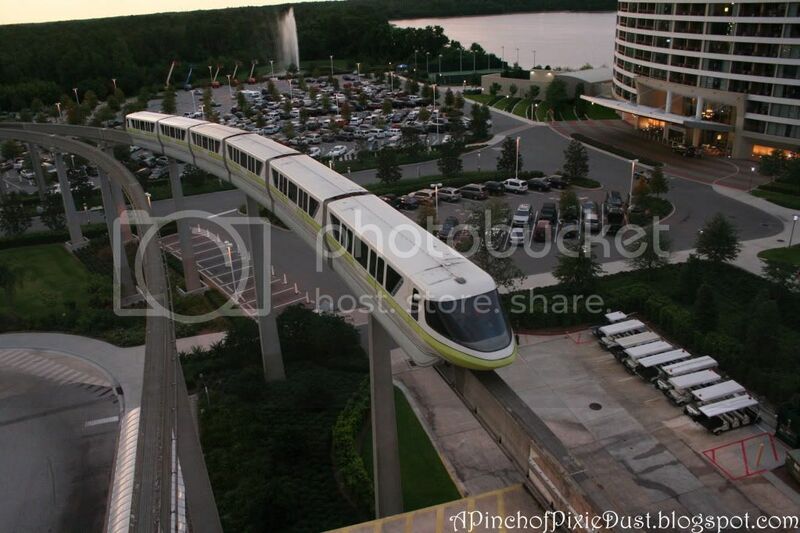 And it was fun to watch the monorail whizzing by below. 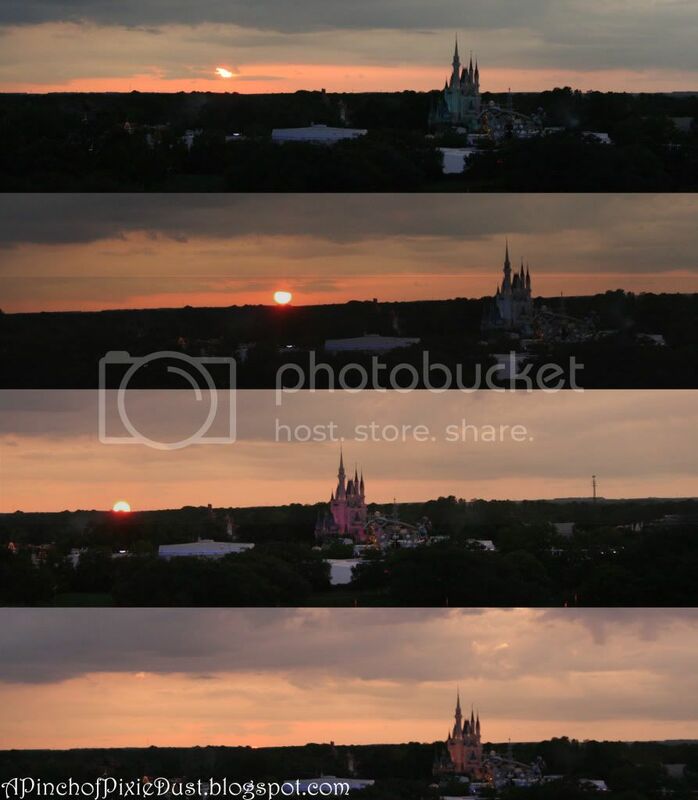 But what I loved BEST was watching the sun set over the Magic Kingdom. One of the most gorgeous sights I have ever seen. And those CLOUDS! It looked like the castle had dropped straight out of the sky! SERIOUSLY. 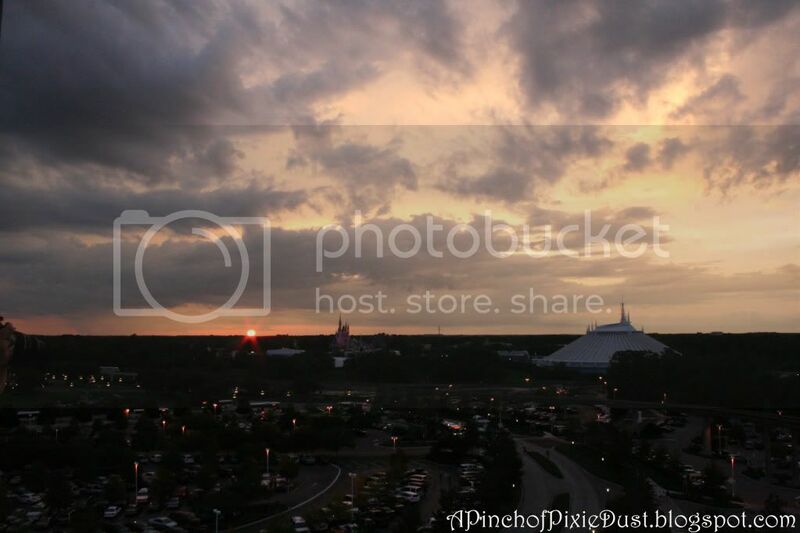 Does it not look like a lovely castle cloud that just touched down to earth? 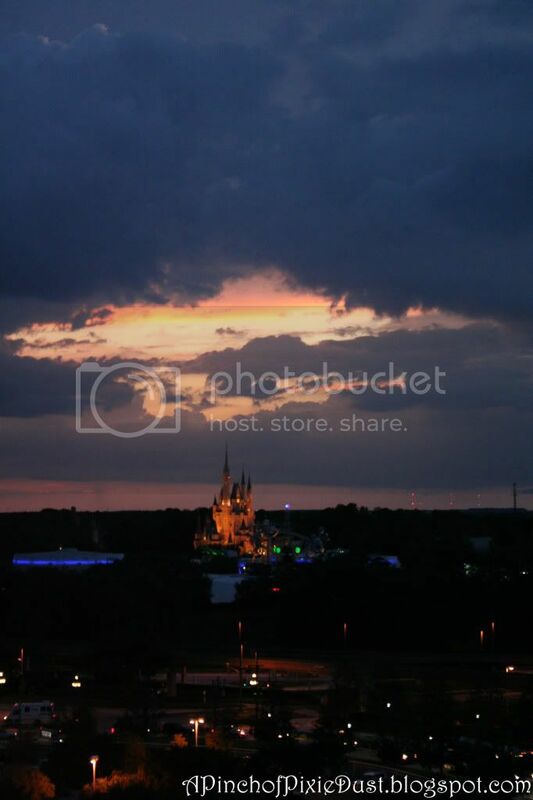 I wondered if there was someone watching the sky and controlling the castle lighting that night, because I have never seen it look more beautiful or more perfectly matched to the sunset. STUNNING doesn't even begin to cover it. It looked like a gift from heaven the sky dropped down and left, as the purple twilight clouds closed over it and claimed the sky for the evening. 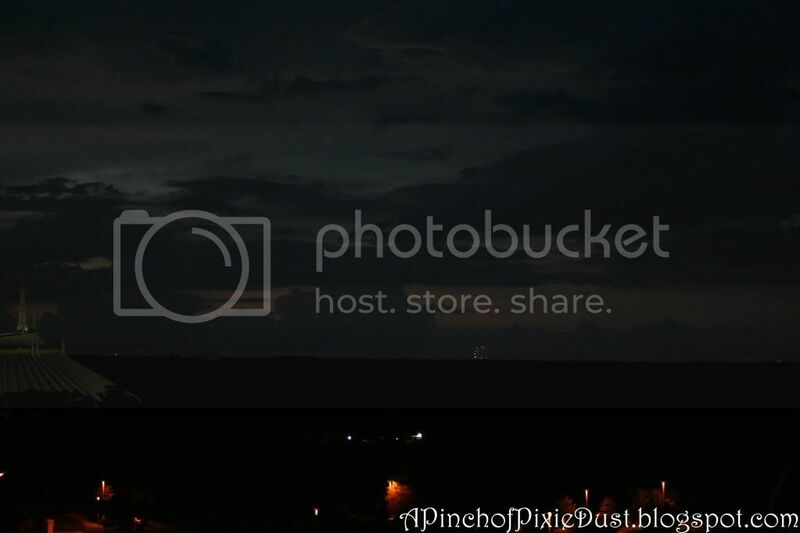 As darkness began to fall, you could see fireworks going off all across that flat Florida horizon. It was so cool to watch for the glimmer of distant bursts! So beautiful and mysterious looking, even after the colors were leaving the sky! 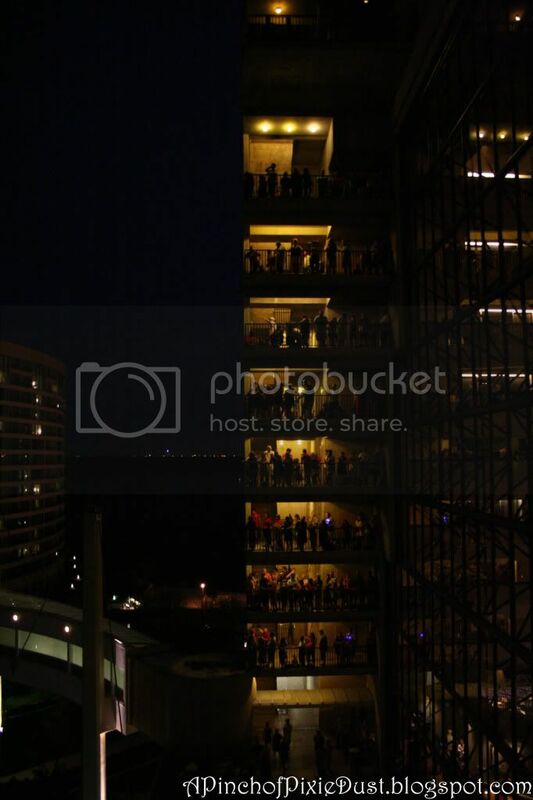 The fireworks were about to begin and the balconies were completely packed! 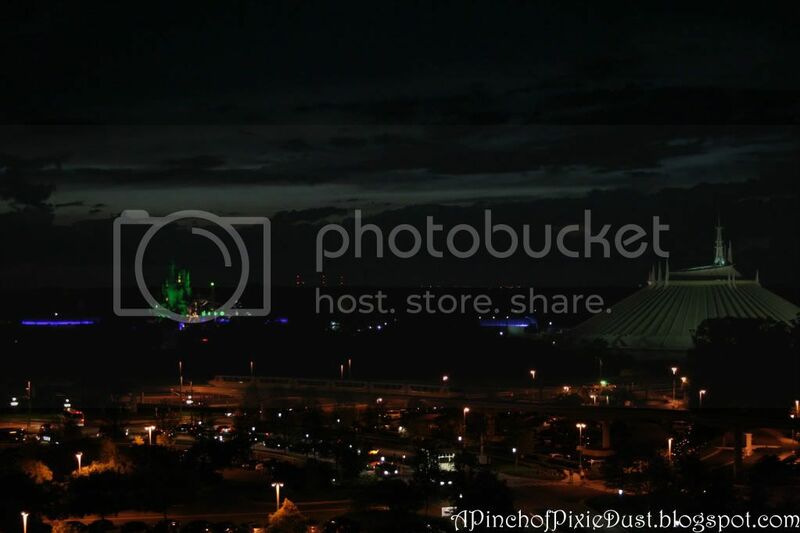 Cinderella Castle turned green - not a color you often see it! - just before the show started. The funny thing about watching fireworks (any time of year) from the Contemp. 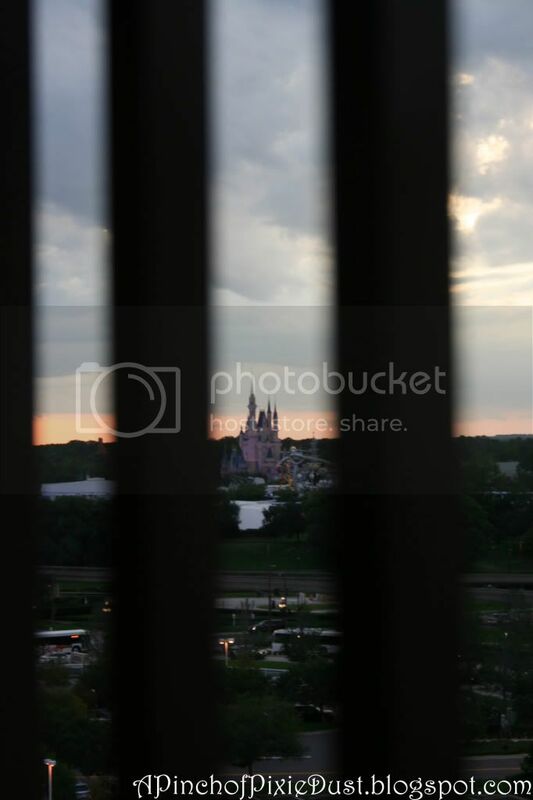 is that you have the bursts framing Space Mountain instead of the castle! 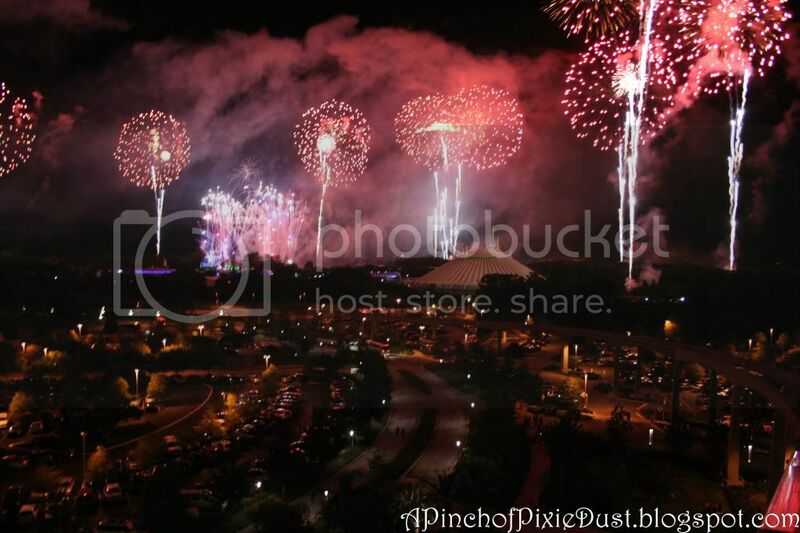 These fireworks were absolutely spectacular, and just kept getting more so as the show went on!! I loved the bursts that changed colors - from red to blue to white! 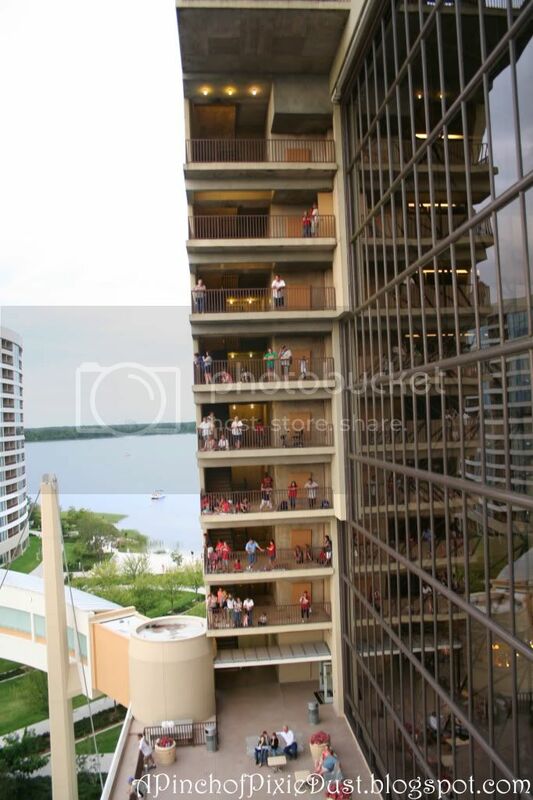 I do have one regret: they were playing the fireworks soundtrack on the concourse balcony, but on the tenth floor I was just a little too far up, and I couldn't hear it very well. It didn't make much of a difference, but good to know. 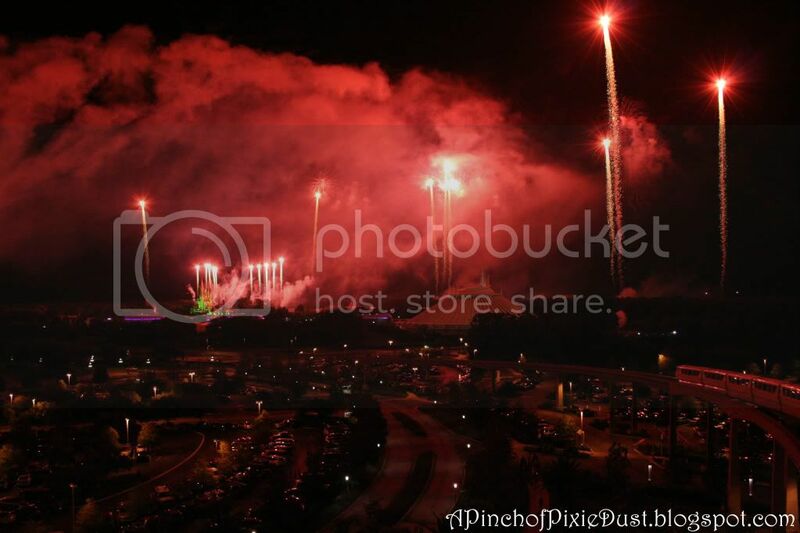 love love LOVE the perimeter fireworks -- these are the ones you come to see!! 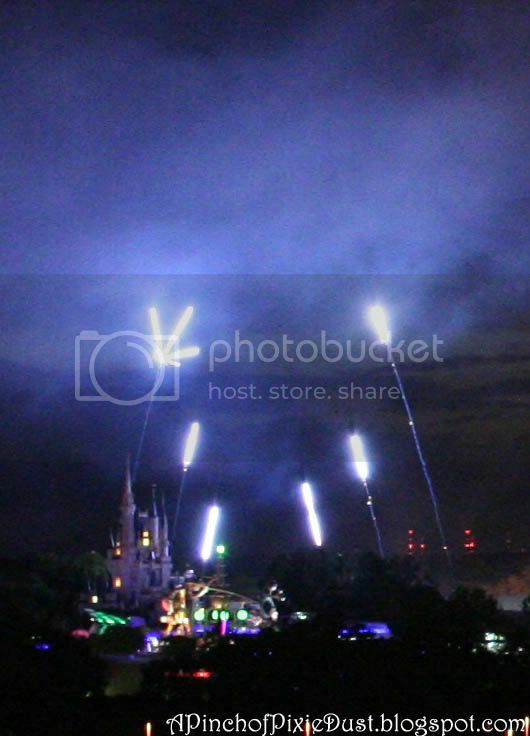 The framing fireworks right around the castle looked so cool too! Then in BLUE! 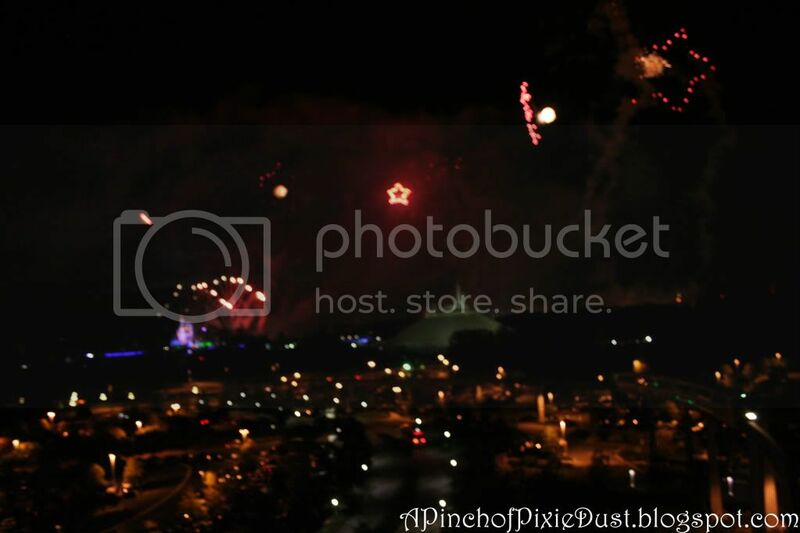 Perimeter fireworks look SO COOL from the Contemporary, the way they circle the Magic Kingdom! 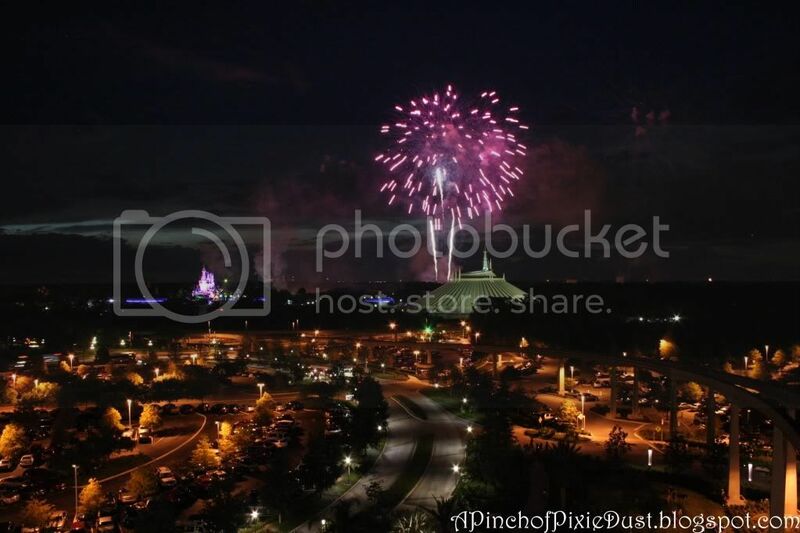 I am so glad to have experienced the Fourth of July fireworks -- and I would highly recommend the resort rather than in-the-park viewing. It's great not having to go into the park (and saving the cost of a ticket) and it's also great not having to get out of the park and fight the sea of humanity. 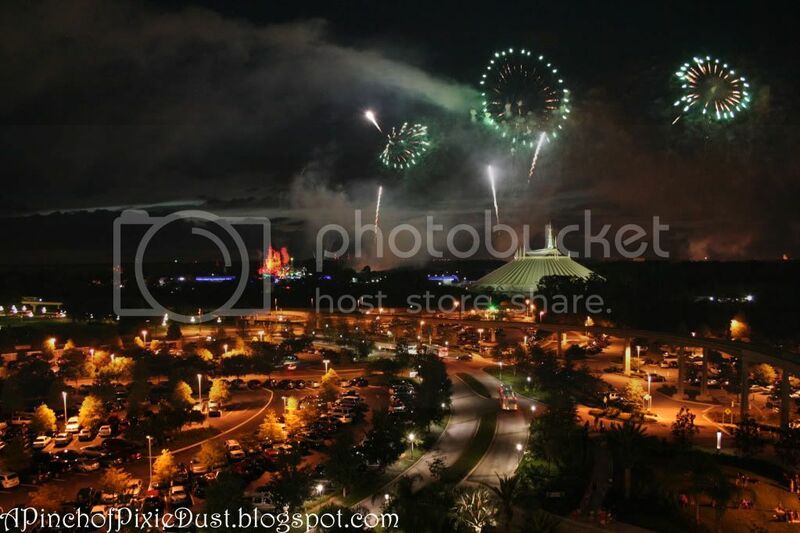 The Contemporary gives such a unique view of the perimeter fireworks too, that I think I would even prefer it to watching from the park, or watching from the Poly beach. 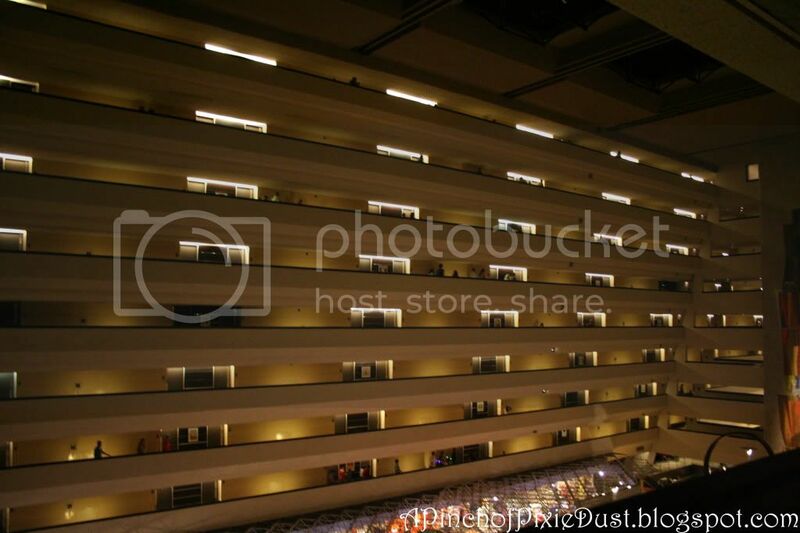 It was fun to see everyone walking down the halls on the various floors after the fireworks ended! But it had been too fun of an evening for me to want it to end quite yet. 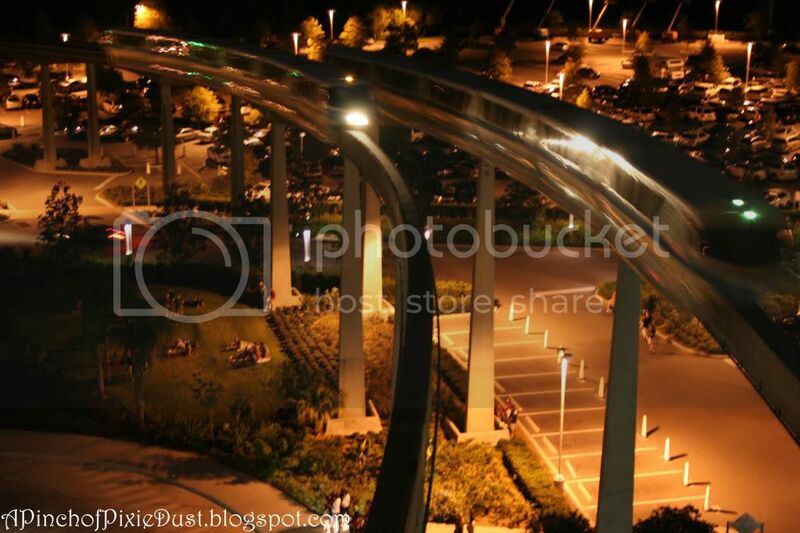 I went back out to the stairwell and climbed all the way up to the rooftop terrace on the California Grill level. 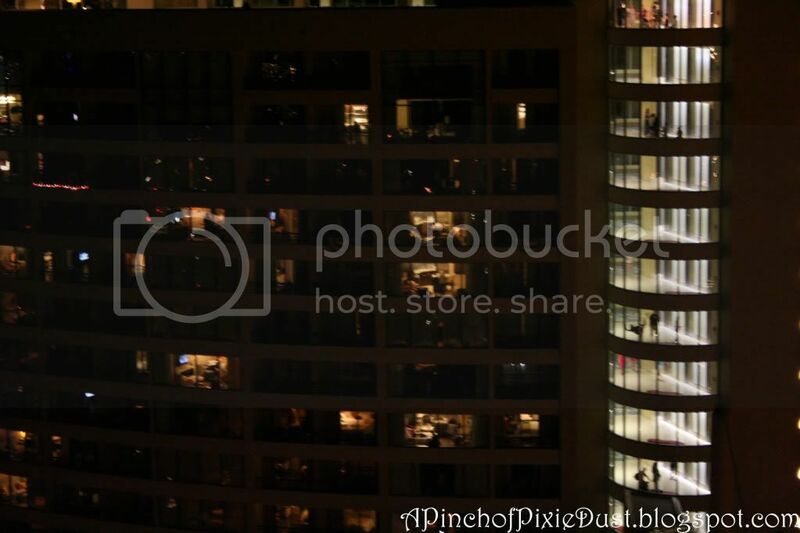 It was like a picture book to look down at Bay Lake Tower and all the lighted windows. It's hard to see in the dark, but some of the railings had patriotic bunting or lights - so fun! 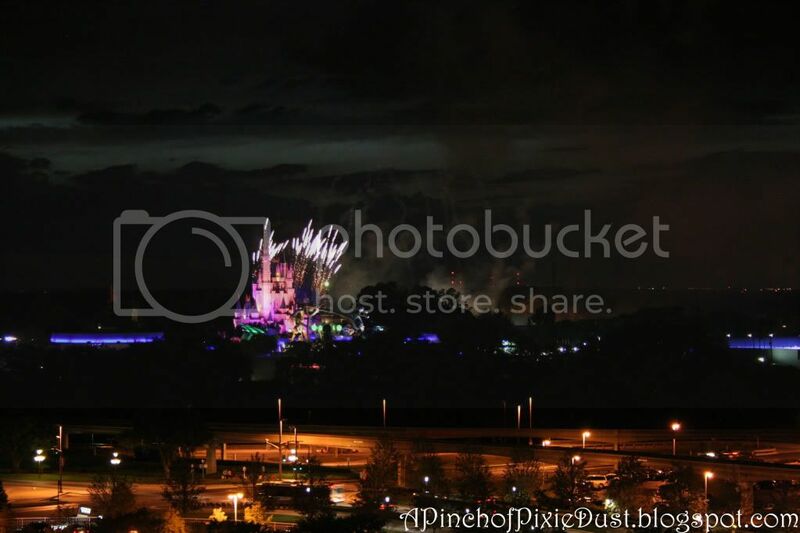 The Magic Kingdom fireworks may have ended, but fireworks were still bursting up across the dark horizon. 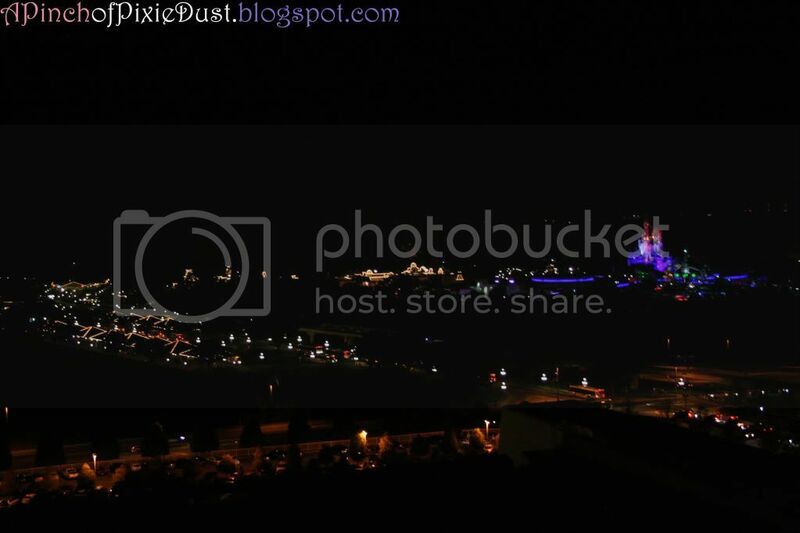 I had an even better view of them from the rooftop, and it was so magical to watch them cropping up all over the skyline - another great bonus to watching from the Contemporary! 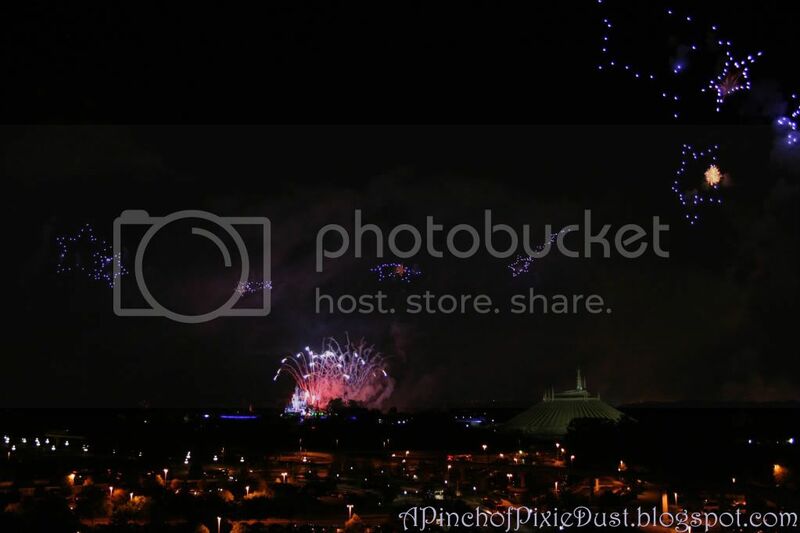 The castle continued to gleam in red, white, and blue after the fireworks were finished! 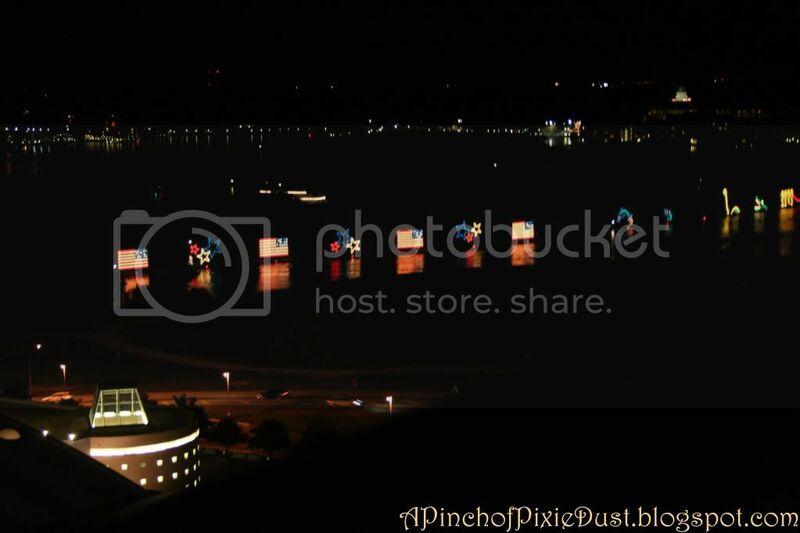 Watching the stars and stripes glitter on the Seven Seas Lagoon as the Electrical Water Pageant went by- perfect way to close out Independence Day? Oh. yes. very beautiful! 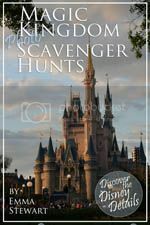 And there is NO way I would be at MK for that either!! Even those CR balcony areas are full!!! 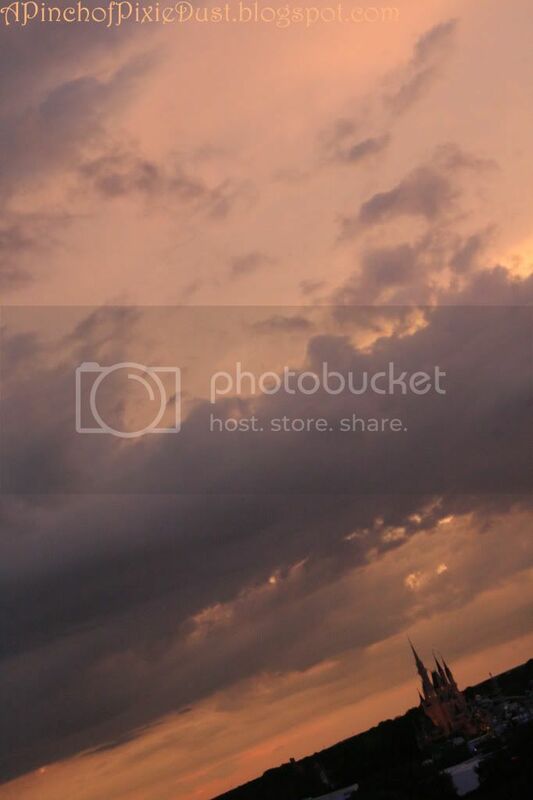 I do love that cloud/castle picture...spectacular!!! !